A device used the linear collider’s hadronic calorimeter could soon help detect cancer. It would also be the central part of what is likely going to be the world’s smallest calorimeter – so tiny that it can fit on the tip of an endoscope to be inserted into a person’s stomach. Since January 2011, a consortium of some 60 scientists from 13 institutes all across Europe is officially building the world’s first in-body calorimeter, funded by the European commission in its 7th Framework Programme with about 6 million Euros over a period of four years. The partners have just returned from Marseilles La Timone hospital, the home of the project’s coordinator, professor René Laugier, and place of its kick-off meeting. 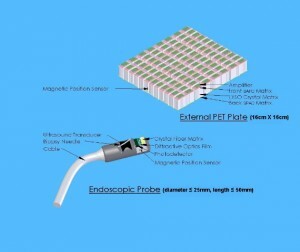 Its name is almost bigger than the device it will produce: Endo-TOFPET_ US, which stands for multi-modal endoscopic probe with Time of Flight Positron Emission Tomography and ultrasound. The goal of the project: develop and test new biomarkers for pancreatic cancer. This extremely challenging medical task requires to build and operate a detector with unprecedented space resolution for the detection of pancreatic cancer. It is a new multi-mode tool for medicine, combining ultrasound and PET imaging techniques to significantly improve the resolution of cancerous tissues. Conceptual design of the detection part of the Endo-TOFPET_US project. The keyword here is detection: medical doctors work together with detector-developers from the particle physics community to merge the expertise of both worlds. It’s not the first time this happens, of course – the project draws on a long and successful cooperation expertise from PET scanning, a medical diagnostics method where detector technologies from particle physics are being routinely used in hospitals around the world. The innovative device would be as small as four cubic centimetres and could be inserted into the patient’s stomach. Its partner detector (see info box for a description of how PET scanning works) is a detector plate of 15 by 15 centimetres of more conventional design that will sit on the patient’s abdomen to form a direct line with the endoscope inside the body. The combination with the small detector head on the endoscopic probe placed a few centimeters away from the organ under investigation (the pancreas in this case) provides a sensitivity 100 times higher than whole-body PET scanners. This means either a reduced radiation dose for the patient or a better resolution of the parts that have to be surgically removed. An unprecedented PET timing resolution is needed because the organs surrounding the cancer tissue is active as well. 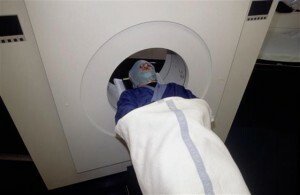 In a traditional positron emission tomography or PET scan, the patient receives a tracer liquid containing radionuclides that emit positrons when they decay. When these positrons encounter electrons in the patient’s body, particle and antiparticle annihilate and two gamma-ray photons are emitted in virtually opposite directions. These photons are then seen by a detector, generally consisting of an inorganic crystal coupled to a photodetector, and with the help of specialised software the location of the annihilation and thus of heightened activity in the body can be identified with high precision. The detectors will be integrated and tested at DESY, building on the experience in large-scale detector integration and in the operation of multi-channel SiPM-based detectors. The technology frontiers in inorganic crystals, diffractive optics, single-photon detectors, time-of-flight readout electronics contributed by the partner institutes of the consortium will be assembled at DESY into it final form. The photo-detector used in the project is a siliconphotomultiplier or SiPM, which is also used in one of the linear collider’s hadronic calorimeters for its ability to measure single photons. It has been a study object for medical uses for many years (See “How a calorimeter could save your life”, ILC NewsLine 19 April 2007). The SiPM group at DESY is leading one of the work packages of the project, and the existing facilities will be put to good use in the next three years. In the final year of the project the device will move from a laboratory test bench into real hospitals for testing (on animals and finally on human patients).